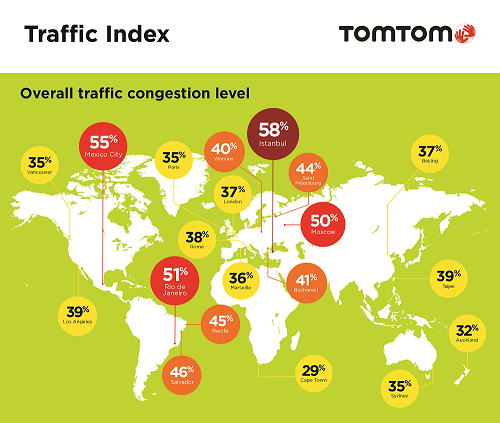 The TomTom Traffic Index released earlier this month reveals insight about congestion and traffic patterns in South Africa. Cape Town, in 55th position on the global index, remains the most congested city in the country, with morning commutes adding up to 72% to commuting time. Johannesburg listed at 77 fares only slightly better, with morning travel adding up to 59% to commuting time. ‘The data suggest that coastal cities are more congested,’ explained Carey Dodd, Marketing Manager for TomTom Consumer in South Africa and Sub Saharan Africa, at a recent roundtable discussion of the index. Pretoria, East London, Durban, and Bloemfontein don’t appear on the rankings because their inner central business districts (CBD) don’t meet the criterion of having a population larger than 800,000. 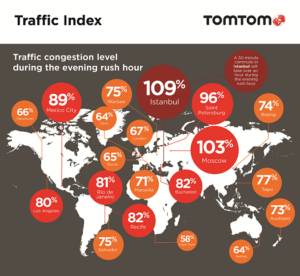 Jaap Schaapherder, TomTom Africa Key Account Manager, mentioned that the cities of Johannesburg, Durban, Cape Town and Tshwane are redesigning roads based on the congestion data from TomTom. The extent of this use will be the subject of further stories. Etienne Louw, TomTom Africa General Manager, stated that there are 700,000km of roads in South Africa and 9 million overall in Africa. The company boasts that the quality of their maps is ‘better than competitors’ and is able to send out map updates to 400 million GPS units within 2 minutes through its network. Louw did state that SANRAL is using TomTom data for road design and to alleviate congestion, but that the company is not consulted on policy at the roads agency. When asked if TomTom’s traffic data has been used by RTMC to understand trends in road accidents, Louw would not comment on why RTMC hasn’t used the data. He cited that there was a ‘long selling cycle’. Deep in South Africa has contacted the RTMC for confirmation and comment.